I bought my first and only Fruity Teucrium from Fat Cat Farm (now closed) at its close-out sale in June, 2013. It was in this four-inch pot, and I was told it was drought resistant, low growing, and tolerated poor soil. I had just the spot for it. 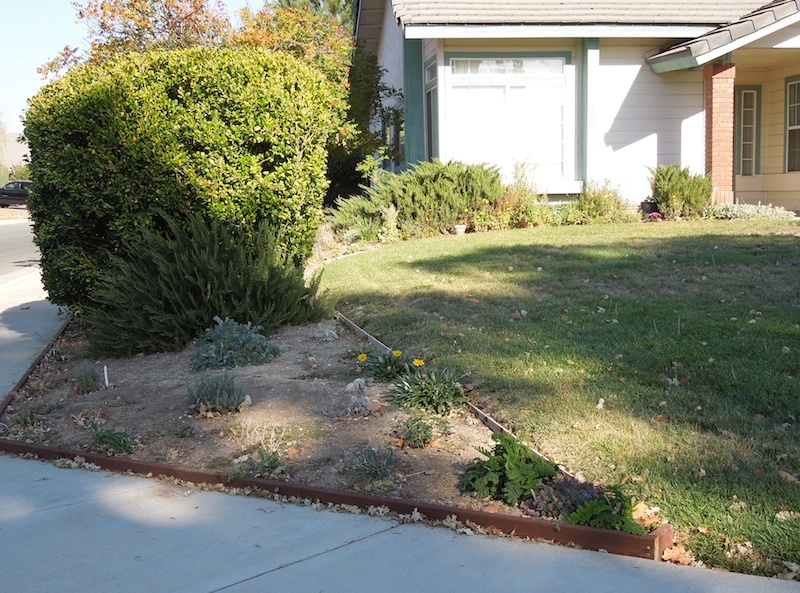 I planted it not long after purchase in a pointed side bed in Paso Robles, known for hot dry summers and water rationing during summer. The soil is very poor. It is hard to water that part of the side bed because the sprinklers won't stay within the boundaries of the bed. I wanted to be able water this section as little as possible. 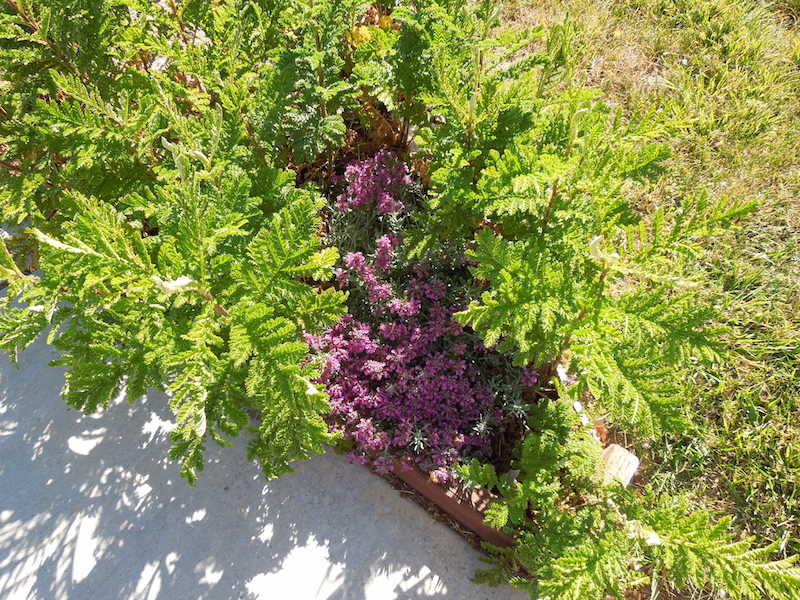 That's why I planted tansy, also drought-resistant, on either side of the fruity germander. 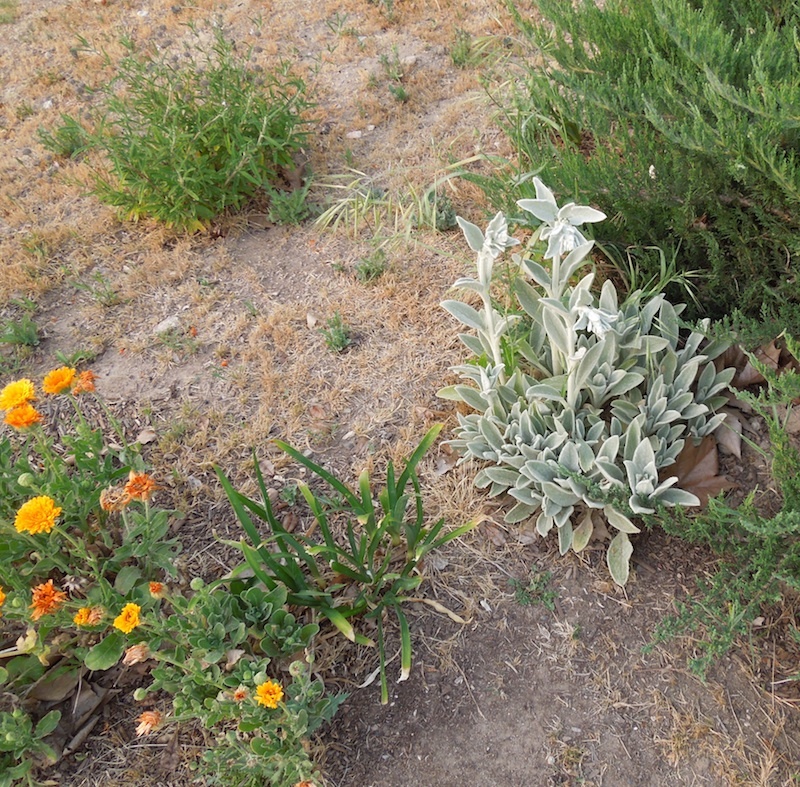 The bright green tansy is on the very point of the flower bed on either side of the Teucrium Cossonii, which appears gray and purple. It is still small in October, four months after it was planted. Please click this or any photo here to enlarge it. 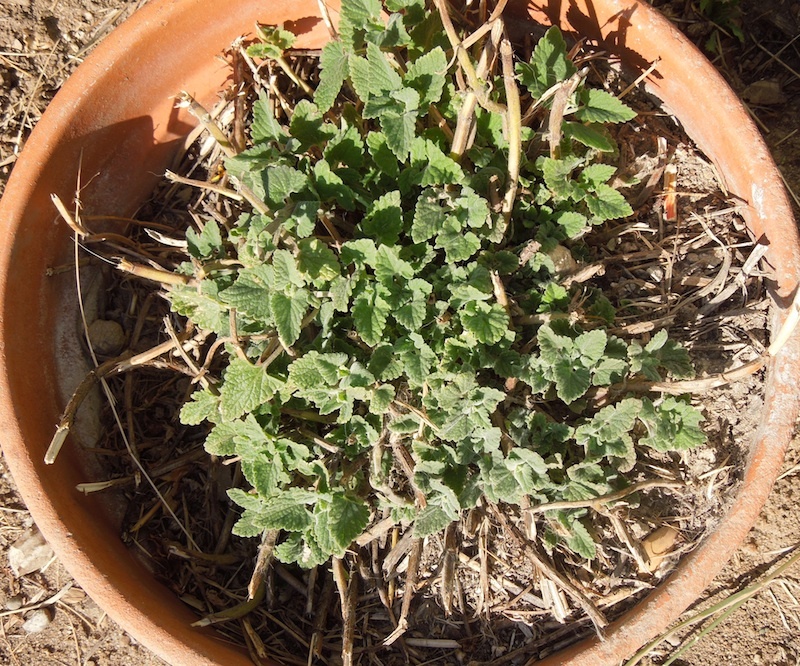 This is how the fruity germander has spread in a little over two years. This photo was taken near the end of August during a heat wave. This plant does not tolerate much water. 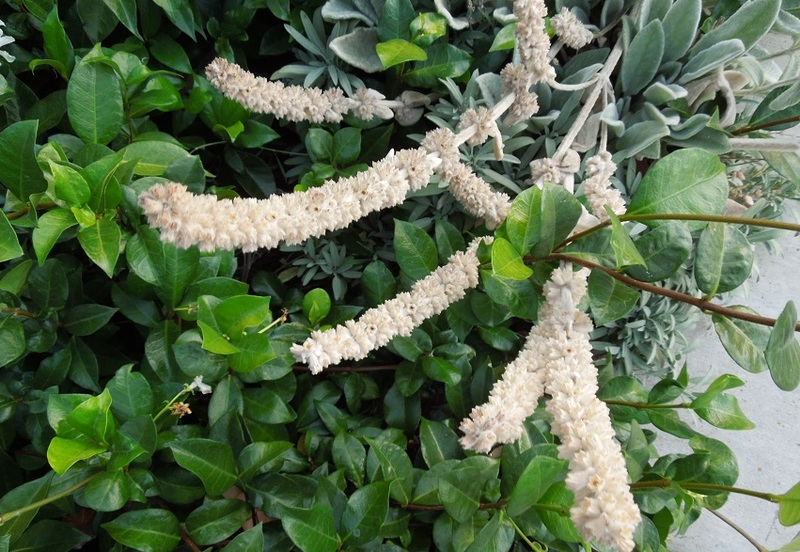 It doesn't like wet feet, but will survive some watering in well-drained soil. This is a close-up of one of the Teucrium Cossonii flowers. The flowers are very small and the entire plant grows low to the ground. I am hoping to divide this plant this fall so that it will eventually cover this end of the flower bed. This photo was taken at the end of May, 2014. You can see how the tansy takes over in spring. It gets tall and blooms. Then it dies back in the heat of summer and needs to be cut back. 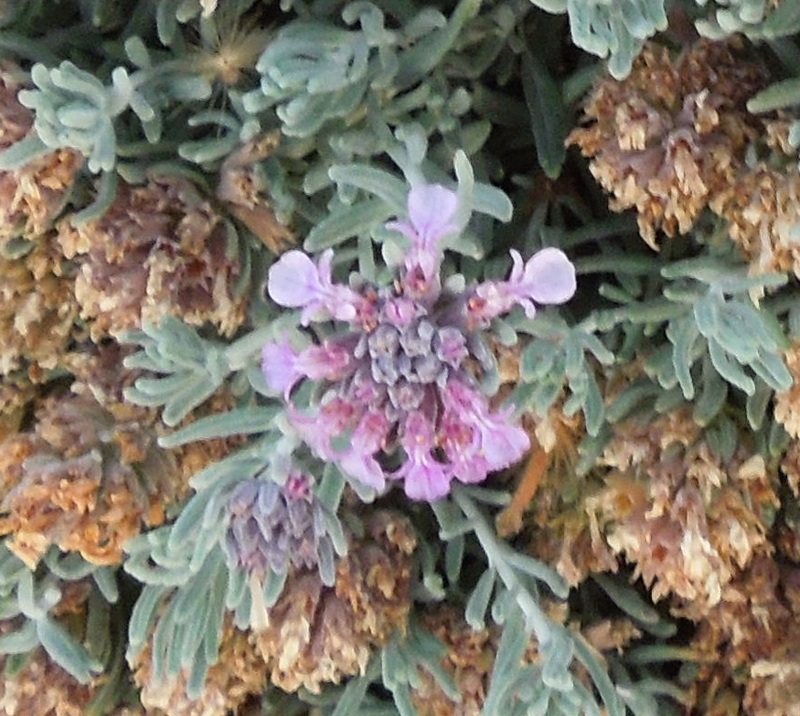 Then the fruity germander steals the show again. If I had it to do over, I would probably not have planted the tansy so close to the Teucrium Cossonii. These books will help you select drought-resistant plants and lawn substitutes for your garden. 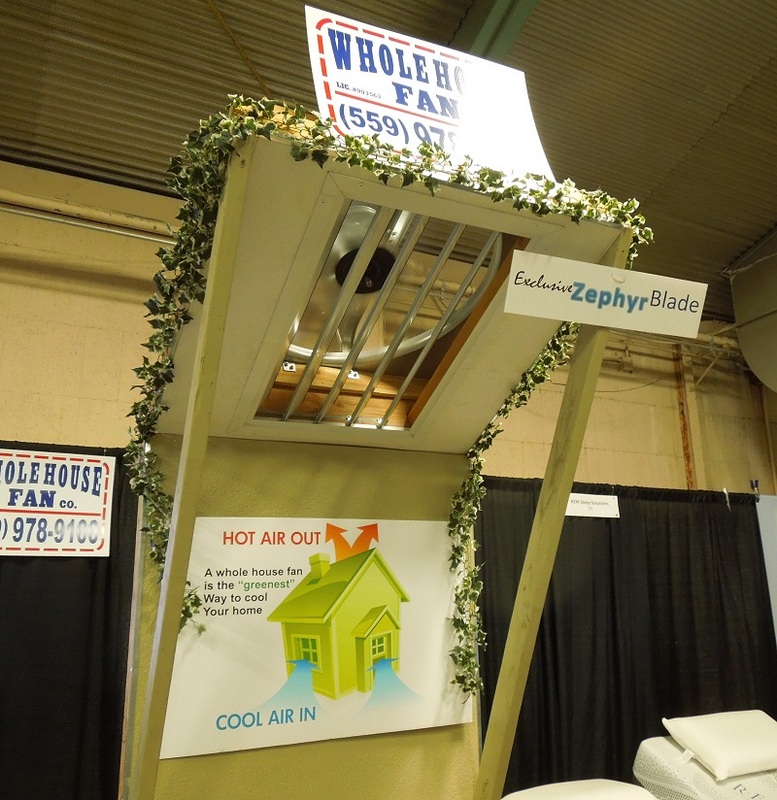 Today was the first day of this weekend's Inspired Home, Garden, and Gourmet Expo. My husband and I attended to get information for possible solutions to save more energy and soften our water. 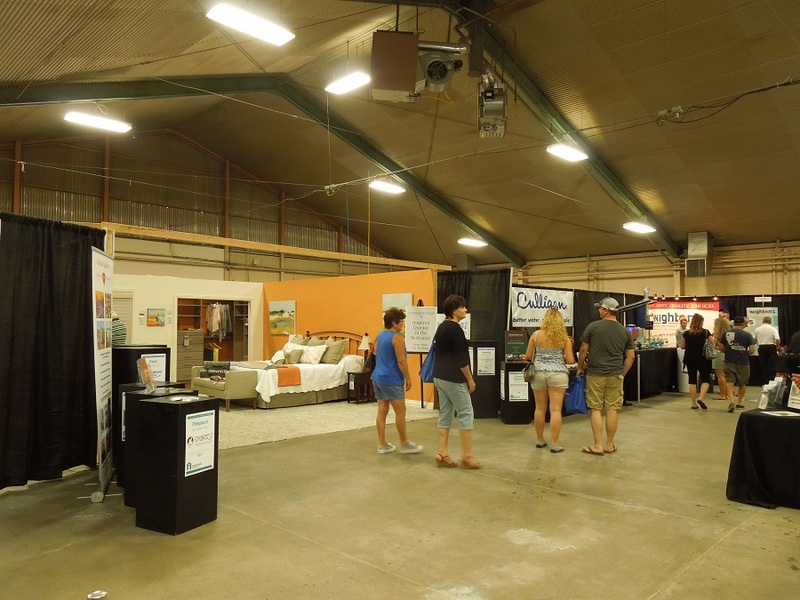 I will have to credit the sales reps for the companies represented for working hard during what appeared to be a slow show by the time we arrived in mid-afternoon. I'm afraid most of them were disappointed that they didn't succeed with selling us any of their show specials. It's not because they didn't try. This aisle shows some of the exhibitors at the show. The rep for this Whole House Fan wanted to be sure you could see how it was hidden from view when not on. It lives in the attic. The one man who actually might have us returning to the show tomorrow to make a purchase was selling REM beds. My husband tried one just to humor me and because there weren't any chairs to sit on when he was tired. He's been talking about needing a better mattress. Trust me. After spending fifteen minutes on one of these beds, you will want one. My husband was of the opinion that a mattress is a mattress is a mattress until he tried this. I already have a mechanical bed my mom bought about twenty years ago. It will raise head and feet, but it has a cord and when the massage is on it is very noisy and really shakes me up. 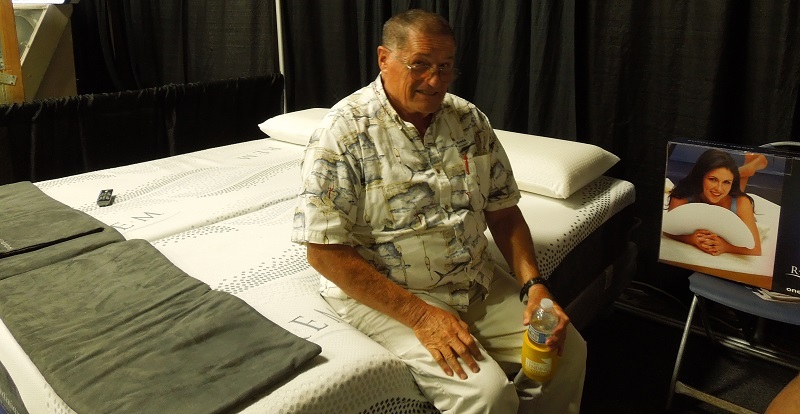 The REM bed has a remote with many different settings and you can't even hear the massage. I don't know if we can afford two new REM sleep systems, but I'm hoping my husband will at least get one, since he needs it the most. I hope I'll at least get a new pillow. I've never experienced a better bed and it was amazing how pain in my back went away with a few touches of the remote to put me at zero gravity. Lying flat I had sciatic pain. With my head and feet in the right position, I didn't. I felt the pain leave my back. I'm tired of triple digit temperatures. The weather man predicts it will be a few degrees cooler today. 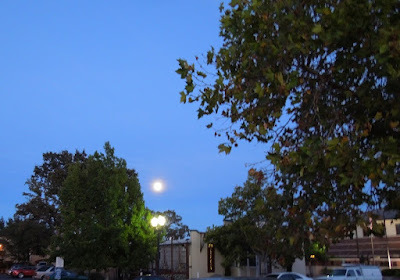 I hope last night's moon is a sign it will be. I took this picture from the library parking lot at about 8 PM. 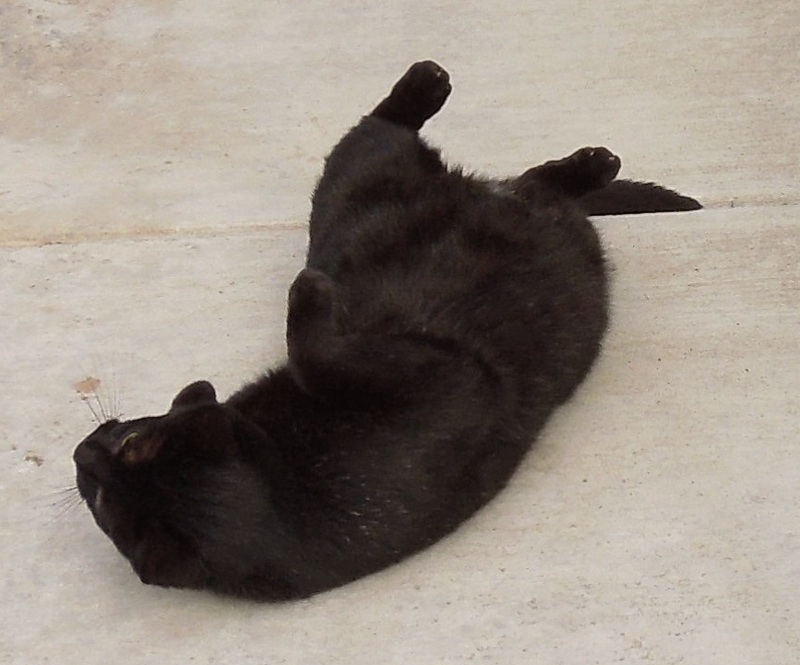 I'm hoping for a cooler temperature because I have to be outside for part of today. I wilt in the heat. I have a meeting at Larry Moore Park between 9 and 11 AM. I also want to go to the home and garden expo at the Events Center in the afternoon. I don't think I will be able to be outside in triple digits. I might be able to handle the predicted 94 degrees, but not for long. I hope the morning will be cooler. 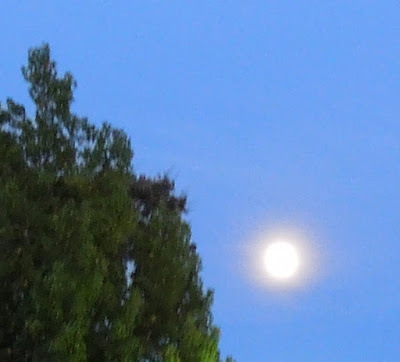 Here is a closer view of the moon. Click any photo to enlarge it. 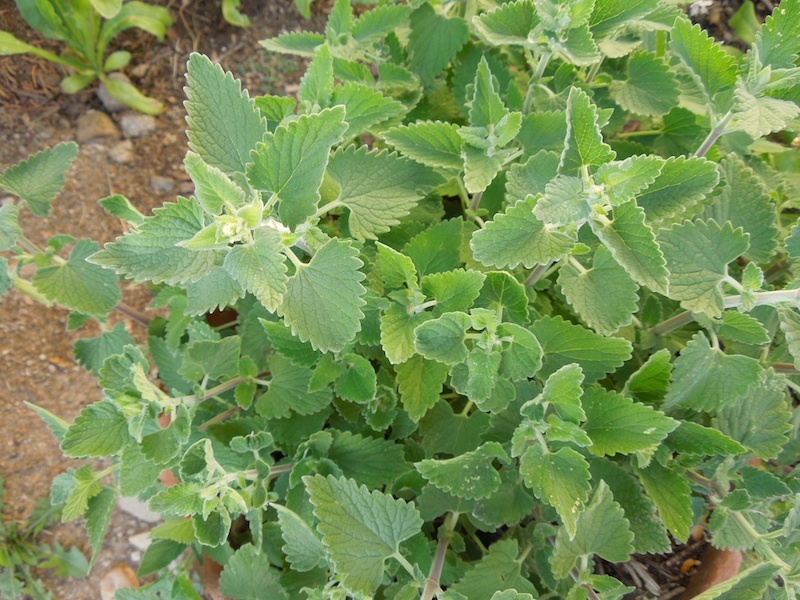 In Paso Robles I have a pot of catmint in my front flower bed. Every year I cut it back, and in spring the new growth starts. 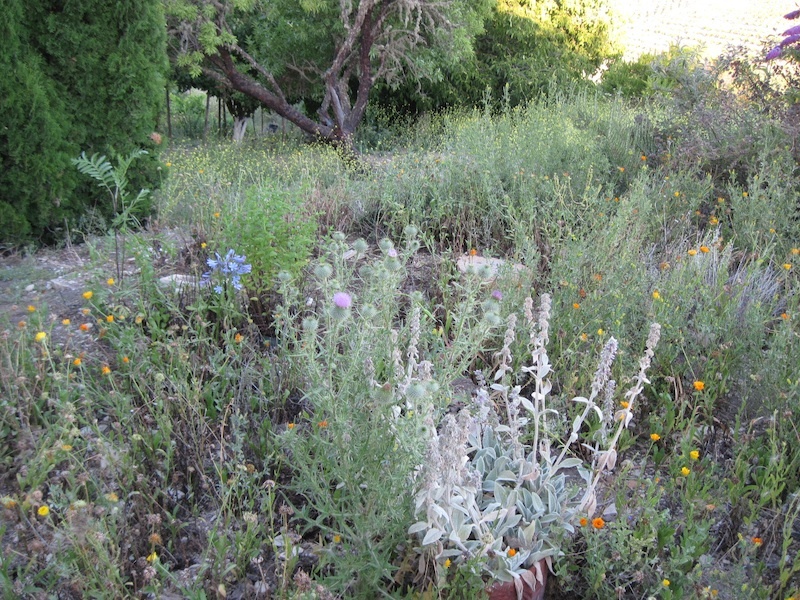 This is how it looks at the beginning of June when the catmint begins to leaf out again. For a closer look at photos, please click to enlarge them. Once the plant begins to leaf out, it grows fast again. This photo was taken a month later in the first week of July. If you look carefully, you will see the buds for the flowers to come beginning to form. 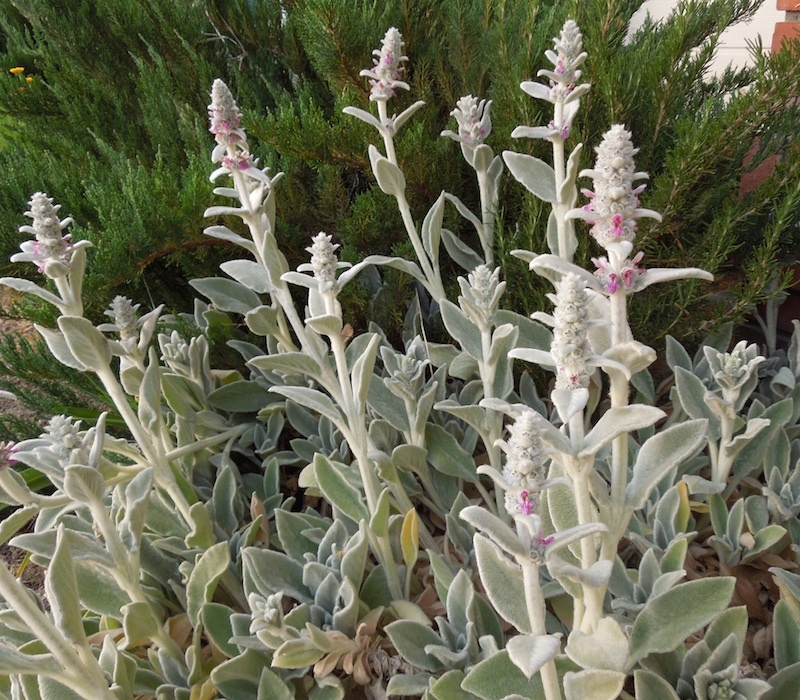 By the end of July, the flower spikes have formed and you see the small blue or lavender flowers appear. 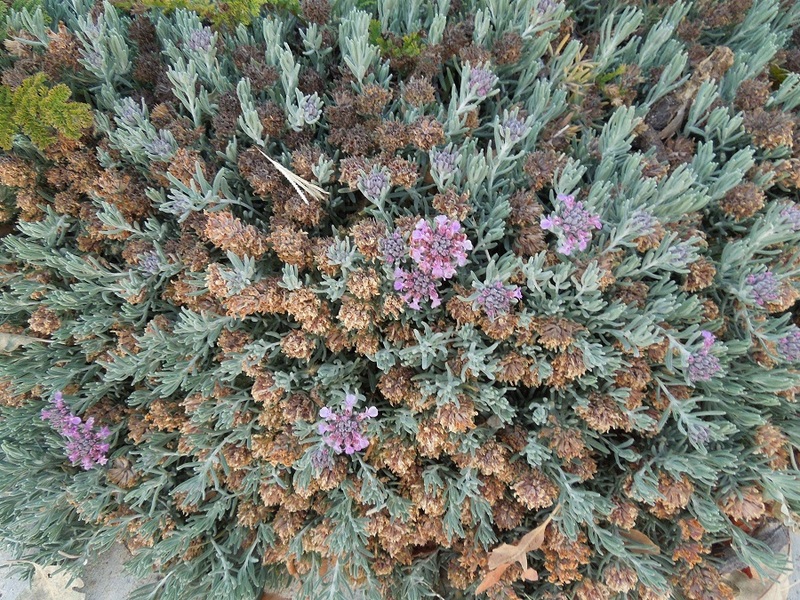 The color of this plant's flowers is lighter than in some other catmint plants, but you can see the faint lavender tinge. It may be that soil conditions are preventing the color from being deeper. It is very dry here and I've not added much to the soil in the pot in a couple of years. 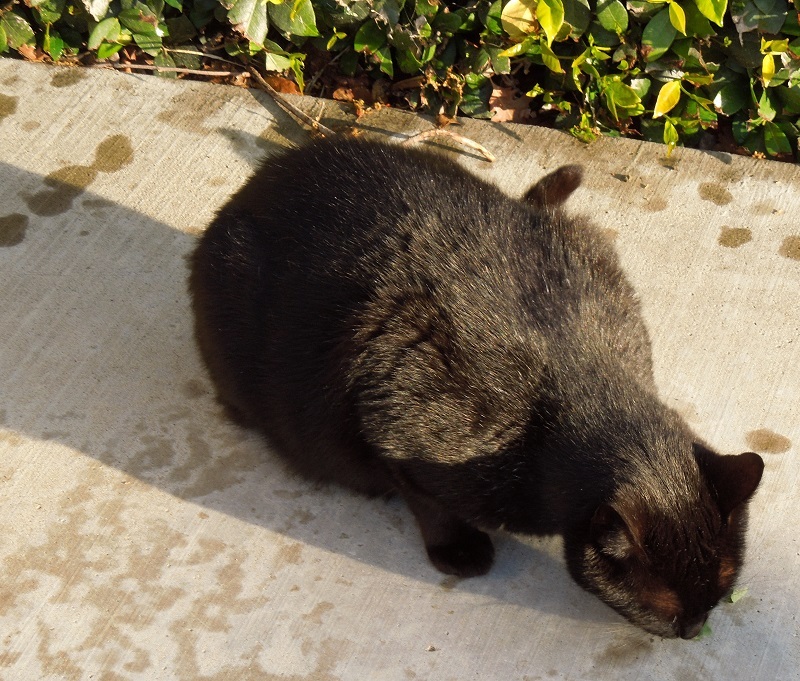 Our neighbor's cat Logan does not care how deep the color is. He comes over to steal or beg for the leaves to chew so that he can get drunk on them. He is chewing on a leaf now. In the photo below, Logan has finished a leaf or two and is definitely under the influence. He will recover and wander home in a few minutes. He will return again. If I'm not here, he knows how to help himself. 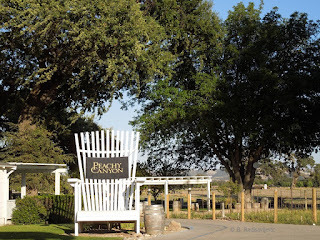 In a previous post about unique sights at Peachy Canyon Winery's tasting room, I showed you a chair made for a giant. 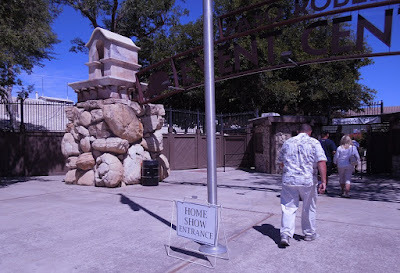 Last time I was there, I discovered they had moved it. Now I know what it's for, and you do, too. 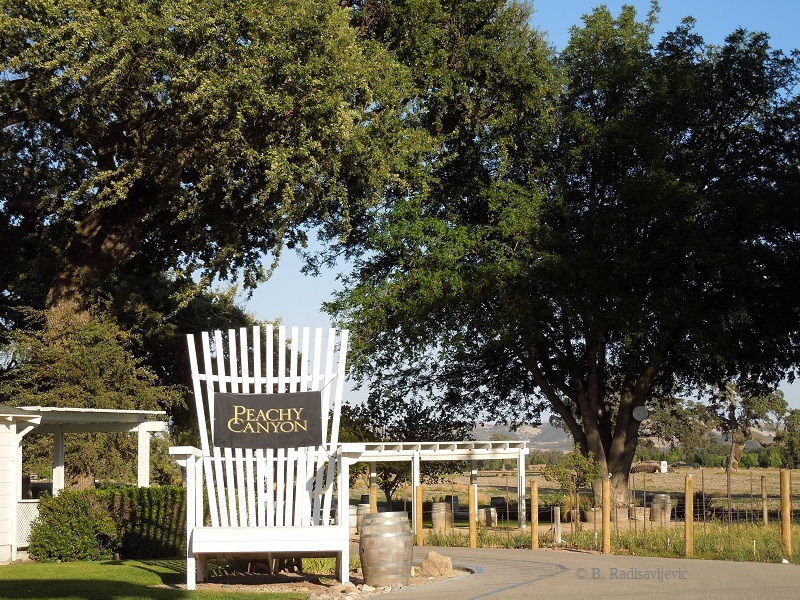 It just goes to show that you never know what you will find on your next visit to Peachy Canyon. I hope we will always find Peaches and Herbie. Here's an old photo I have of Herbie taking a cat nap. 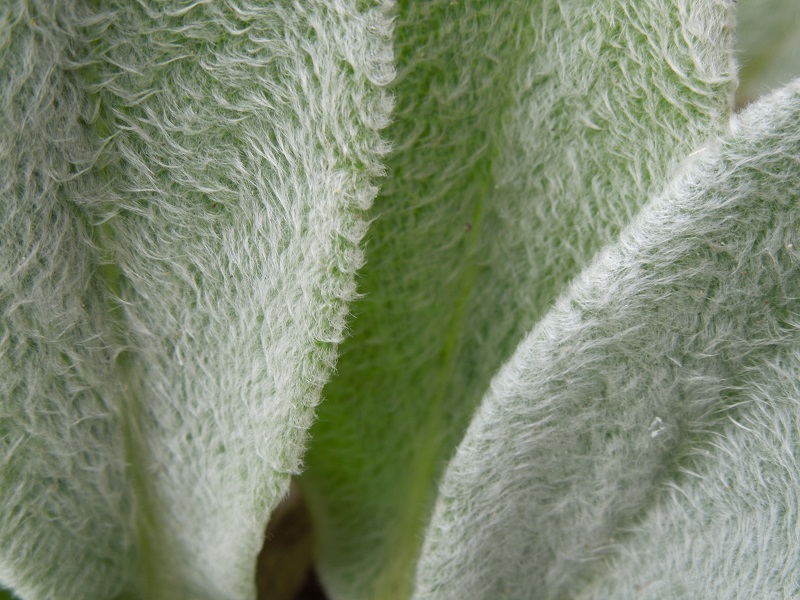 I have always loved the look of Lamb's Ears (STACHYS byzantina) with their wooly leaves. I love touching their softness. I love the way their gray color adds contrast to the green of my other garden plants. 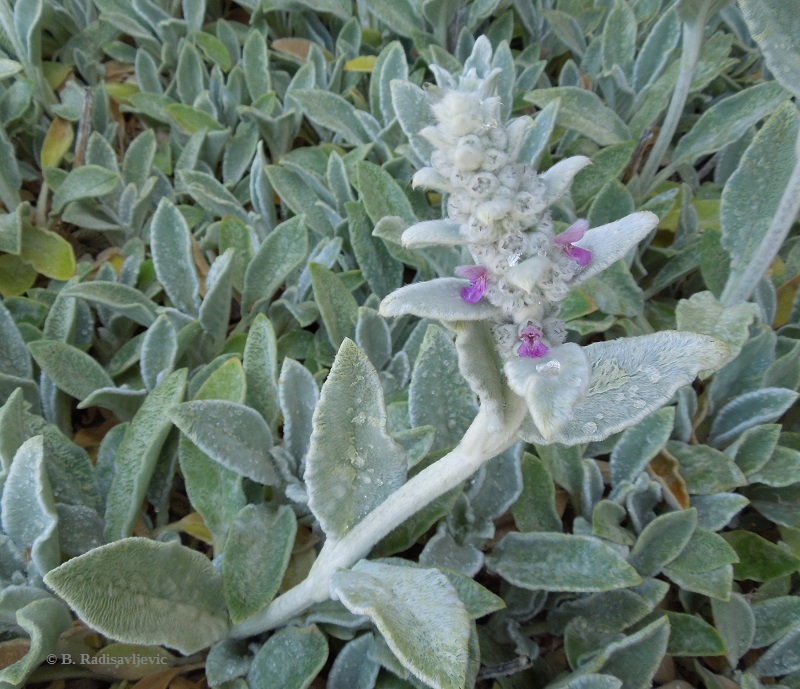 I started growing Lamb's Ears in my Templeton herb garden at least ten years ago in a pot. It escaped, and then I brought a baby plant to Paso Robles and put it in my front flower bed. 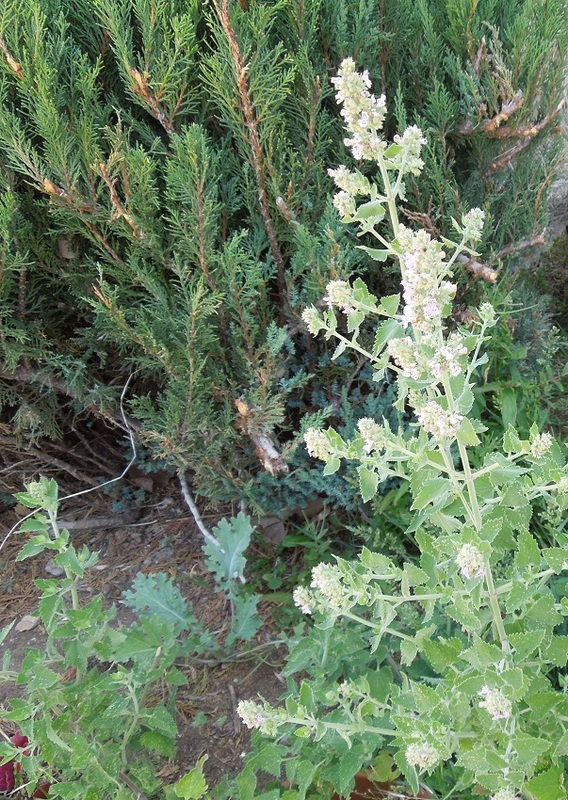 It kept spreading, and now it's in every one of my front Paso Robles flower beds. It seems to thrive in this climate and seems to need very little water. I just let it grow because it smothers any weeds that try to grow through it. 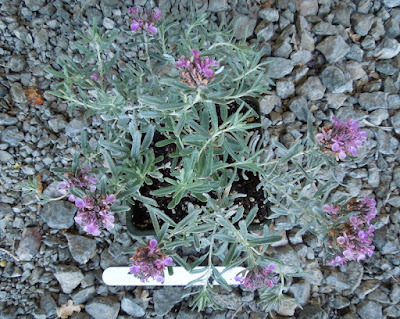 The photo to the right shows that first potted Lamb's Ears plant in Templeton. To its left is a blooming bull thistle plant. You can also see lilies of the Nile (blue) to the left and behind the bull thistle. The orange and yellow flowers are a combination of Calendula and California golden poppies. The photo was taken near the end of June. One of the first babies from this plant I put in Paso Robles is in this photo. This was taken in April before the plant started budding. That was back in 2013. Now the plant has spread to fill in all the empty space to the side and behind. This shot below was taken at the end of April when the plant is just beginning to bud. Below the plants are flowering at the beginning of May. All the flowers do not open at once. The flowers are tiny and delicate, but they attract bees. By June the flowers fill out a bit more. This last photo was taken August 25. By this time the flowers have dried out and gone to seed. The spikes are now leaning toward the ground. I will soon have to cut them back. It's getting to be the time of year when in certain parts of North San Luis Obispo County the tarantulas will be hunting at night. I first saw this one at the beginning of September in 2012 while I was walking on Santa Rita Road in Templeton. Look for them at dusk in September and October. Although many people are afraid of these large spiders because of their size and because they are hairy, most people have nothing to fear from them. They don't bite unless they feel cornered, and even if they do, it affects most people no more than a bee or wasp sting. Only those who are allergic need to worry. Another defense the tarantula has is microscopic hairs or bristles on its abdomen that can break off when touched or even be thrust at an attacker. These hairs can irritate the attacker's skin. What I would really fear being stung by, though, is the tarantula's main predator, the tarantula hawk. See related articles below. Some tarantulas make their homes, or burrows, in trees, but the ones I have seen live in the ground. 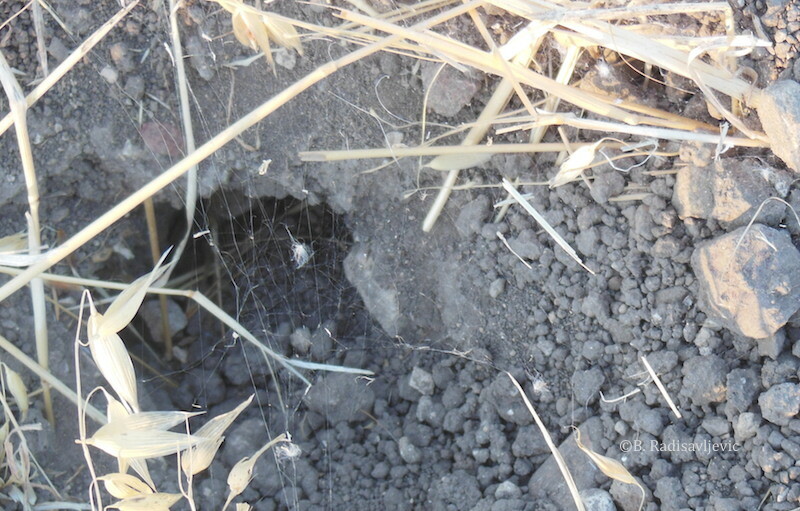 This is one of the burrows I saw near where I saw this tarantula. Notice the spider's silk around the entrance. Here's a good place for a tarantula to live if you want to keep one as a pet. 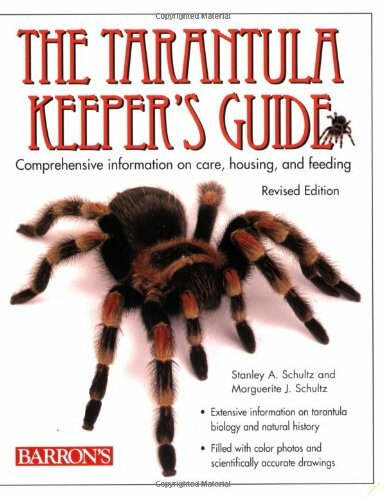 The books below are my go-to books for identifying and learning more about tarantulas. 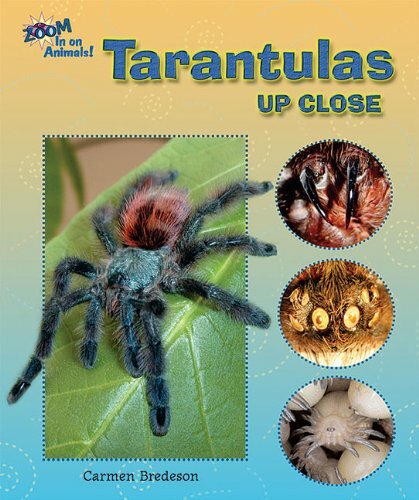 Click here for an even greater selection of books about tarantulas. 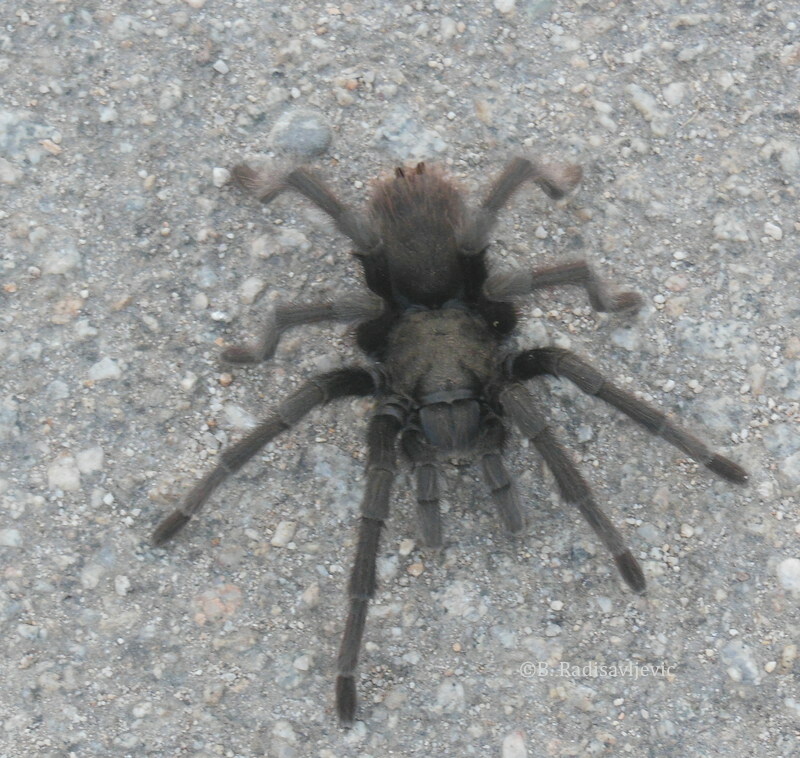 Have you ever seen a tarantula where you live? Where did you encounter it? Are you afraid of tarantulas? 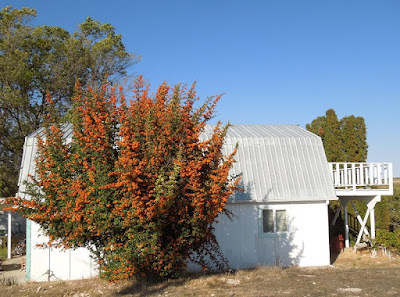 At least I believe this is a pyracantha, commonly known as firethorn, even though I'd always thought it was a cotoneaster. I looked up cotoneaster in my Sunset Western Garden Book tonight and there was no mention of thorns. 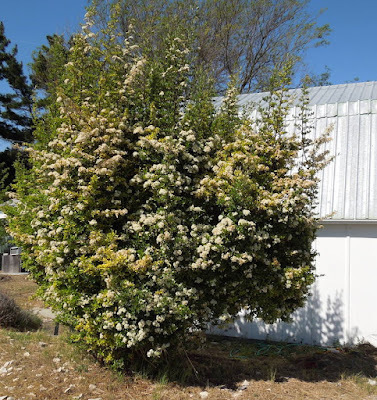 This plant you see in the photo has dangerous thorns, and only the pyracantha description mentions thorns. Both plants can grow tall like this and both have colorful orange or red berries. Both plants can grow in poor soil and are drought resistant. The fruits appears in July or August and last long enough to provide winter color. 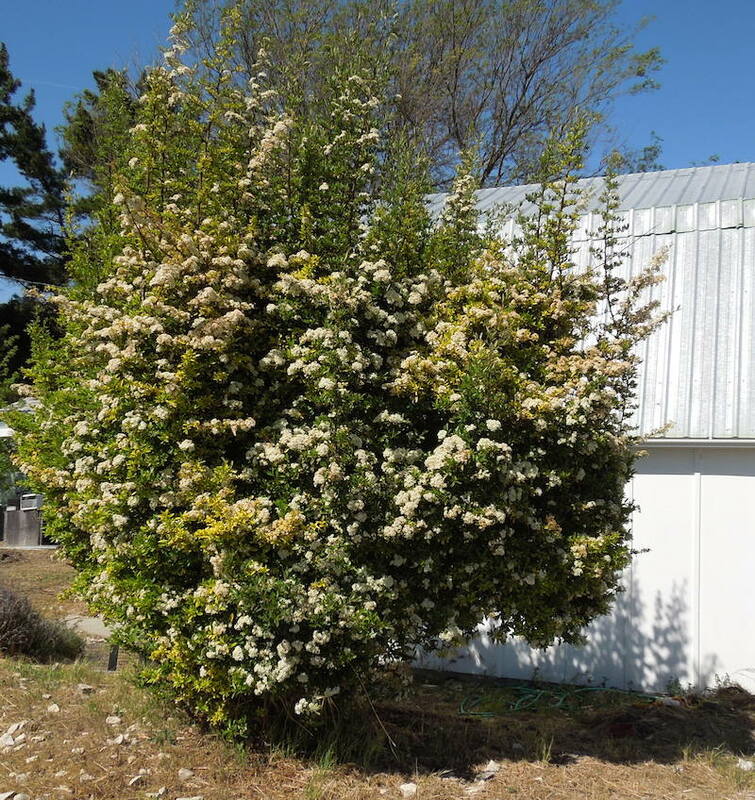 This is the same shrub in bloom in May. The bees love the flowers. I can hear the tree buzzing as I approach it when the tree is in bloom. 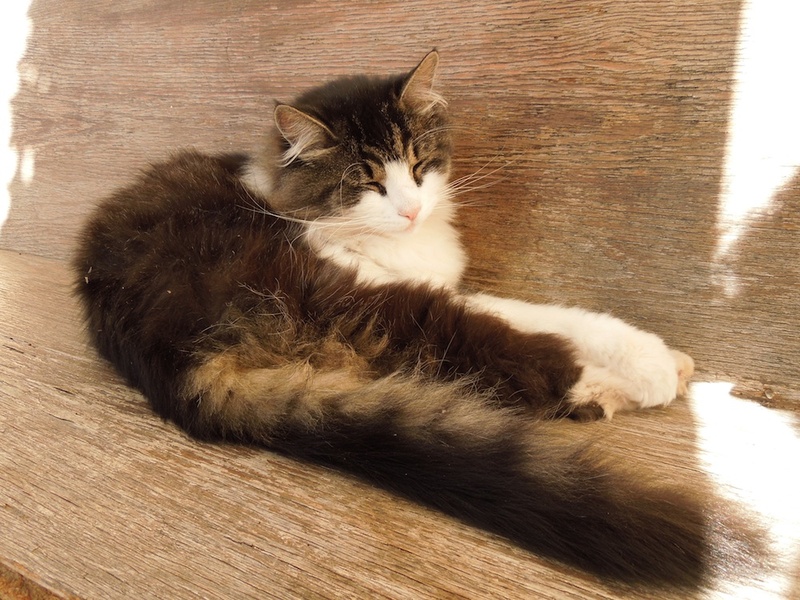 Photos can be enlarged by clicking on them. 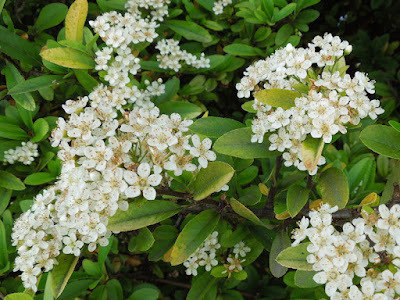 This is a close-up of the pyracantha flowers. I love my Sunset Western Garden Book as a General reference for finding out more about the plants in my garden and selecting plants for special situations or with certain characteristics. In this case, I looked up plants with colorful berries to see what else this might have been, if not cotoneaster. It's a book no western gardener should be without. 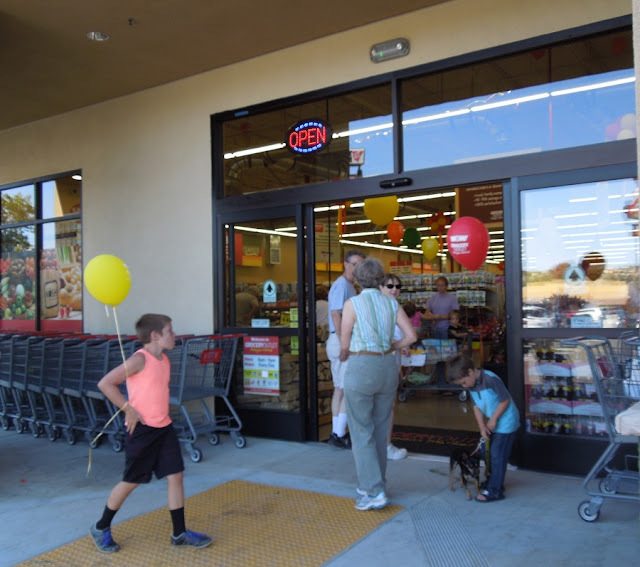 How Does Smart and Final in Paso Robles Compare to the Grocery Outlet? Saturday, August 22, 2015, was the Grand Opening of the new Paso Robles Grocery Outlet. 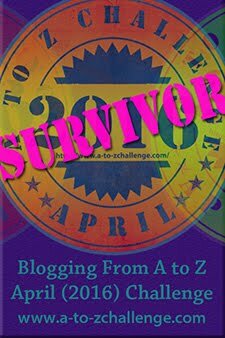 I wanted to see if I could save money on products I have been buying somewhere else, so I decided to check out the new store. I made a list of what I would normally buy at Smart and Final and then went to see how I would fare with that list at Grocery Outlet. The plan was to see what I could find at Grocery outlet and pick up what wasn't there at Smart and Final, which was right on my way home. Pictured here is the Grocery Outlet entrance at 3 PM. I did not want to face the parking lot during the morning rush of people wanting freebies. This is the produce department. That is normally the most important part of the store for me. I was looking for fresh peaches, apples, bananas, blueberries, and vegetables. I bought some good looking mushrooms and some grapes. The bananas, peaches, and apples were packed in bags. I prefer to buy mine individually, so I passed on those. I found my favorite frozen pizza brand at a good price so I bought some, but they didn't have frozen broccoli cuts -- just flowers, and I like it cut up more. I could not find a good selection of yogurts. There was a very good selection of packaged gluten-free and organic products, though. There were also close-outs of brands I did not expect to find there, such as some Kirkland juice in two-packs of really large bottles that won't fit in my refrigerator. Click any photo to enlarge it for a closer view. This shows you most of what I bought at the Grocery Outlet. It's my cart contents ready to put in my car. Some of what I bought is covered by other items. 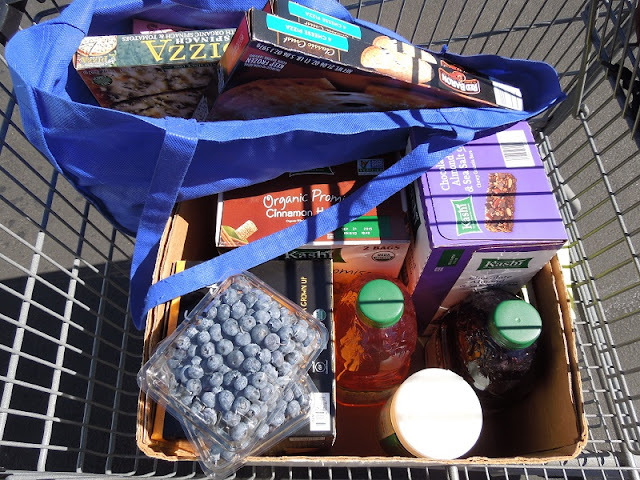 After I finished loading I went to Smart and Final to get my bananas, a quart of plain Greek yogurt, avocados, peaches, frozen broccoli and large sizes of red and white vinegar -- all of which were on my list. In conclusion, if you have a shopping list you may not find everything on it at the Grocery Outlet. It's a bit like Costco. They stock what they get good buys on, and what you find one day may not be there on your next visit, but you may find products you didn't even know existed at a lower price than elsewhere. On the other hand, you'd better know your prices and check the ads of other stores before you shop, because not everything is priced lower there. Smart and Final is reliable about carrying the same brands consistently. It also has the bulk food department. They have a wider selection of frozen, dairy, and deli foods. Fortunately the stores are so close together that you can find almost everything you need at one or the other. 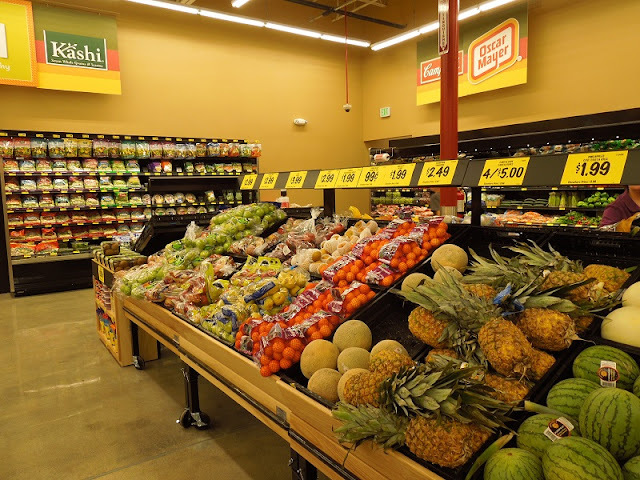 Have you visited the new Grocery Outlet yet? Did you find what you wanted there?